Filling Loop. Once the two securing screws are removed the assembly can be removed by easing the loop/diverter connection apart. 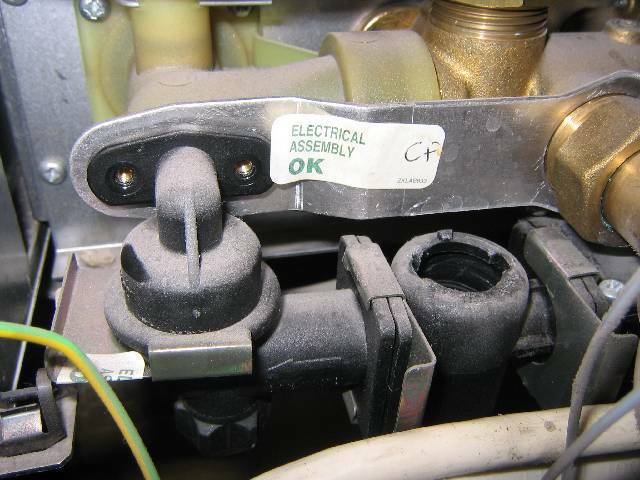 Be aware of the small o-ring between the filling loop and securing plate. With regards to o-rings you will find these have been used on numerous pipe joints in the boiler. In ALL cases these must be replaced with new rings or else you run the risk of leaks where the o-ring has deformed into it's old orientiation yet been replaced in a new one. New rings should be lubricated with silicone grease to minimise damage when reassmebling, help with their seating and prolong their life.